Rabbit Litter Training - Easy or Difficult? Rabbit Litter Training – Easy or Difficult? When you share your home with a rabbit, cleaning up messes on the floor can seem like a nuisance. One solution is rabbit litter training. Just as a pet cat can be trained to use a box for going to the bathroom, so can a rabbit. The process requires patience and persistence but pays off in the end. The first part of rabbit litter training is placement of the rabbit litter box. Most rabbits have a certain area of their cage where they prefer using the bathroom. Once you find that area you can place the box there. Now it may seem disgusting to humans but rabbits don’t mind eating and going to the bathroom at the same time. In fact, they might even enjoy it a bit. That means the litter box should include litter, as well as a helping of hay and maybe even a fresh herb to make the place smell nice and to lure the rabbit into the box for a snack. Also, be sure to place some of your rabbit’s stool and some bedding covered in his urine in the box to fool him into thinking it’s his ordinary bathroom spot. During the early stages of training, pet bunny rabbits should be confined to a small area, such as their cage and a small area where they can exercise. As your rabbit gets more reliable, you can increase his freedom. If you open up large portions of your home to the bunny, you may want to place additional litter boxes around the house, too. Some bunnies take to rabbit litter training easily. Others are slow to catch on. Babies are going to be more challenging to work with than adults. 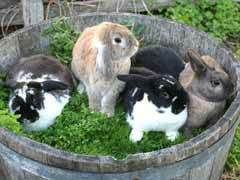 Rabbits who have been spayed or neutered also seem to catch on faster, too. Caring for rabbits means watching for signs of health problems and the litter box can help in that regard, too. When a reliable rabbit starts urinating outside the box, he might have a urinary tract infection, for example. Rabbit runny stool can also more easily be spotted. This problem is generally cause by diets too high in carbohydrates but can also be caused by parasites or bacterial infections so a trip to the vet might be in order. Rabbit litter training has many advantages, but it can be challenging with some bunnies. Most owners are happy they took the time and effort to train their pets, however.